Big horn sheep inhabit alpine meadows, rocky cliffs and foothills throughout the Rocky Mountains from southern Canada to Colorado. Active during the day, they feed on grasses and shrubs in the morning hours. 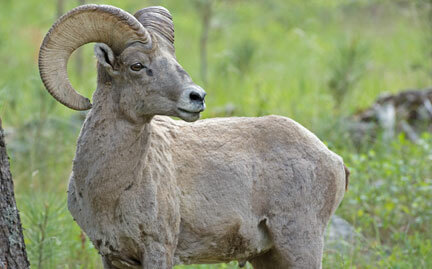 Big horn sheep have exceptional eyesight and are capable of seeing up to two miles away. They are at risk from habitat loss and illegal hunting.